Sign in with a guest (free) or member account to register for EFA courses. This online course is an advanced course in copyediting. Participants should know basic grammar and punctuation and be able to use Microsoft Word, including track changes. (The course does not teach Word skills.) This course is for the experienced editor who wants to build on basic skills and take on more difficult manuscripts. Participants will be editing manuscript excerpts that are especially problematic. Instructor Lourdes Venard is founder of Comma Sense Editing, which provides services to individual authors and businesses. She has 30 years of writing and editing experience, including at major newspapers Newsday, The Miami Herald, Chicago Tribune, Milwaukee Journal Sentinel and The Washington Post. 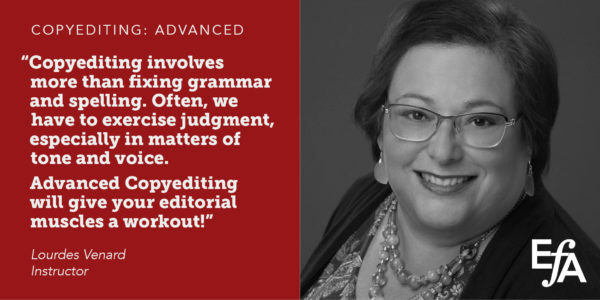 She also teaches copyediting through an online course at the University of California, San Diego, and has co-written an EFA booklet, Sensitivity Reads: A Guide for Editorial Professionals. Our online courses are conducted through Sakai, a learning management system (LMS). You never need to be at your computer at any specific hour. More information about how these asynchronous classes are conducted is available here. Information on our refund policy is available here.